The politicization of climate science is so complete that the lead author of the IPCC's Working Group II on climate impacts feels comfortable presenting testimony to the US Congress that fundamentally misrepresents what the IPCC has concluded. I am referring to testimony given today by Christopher Field, a professor at Stanford, to the US Senate. This is not a particularly nuanced or complex issue. What Field says the IPCC says is blantantly wrong, often 180 degrees wrong. It is one thing to disagree about scientific questions, but it is altogether different to fundamentally misrepresent an IPCC report to the US Congress. Below are five instances in which Field's testimony today completely and unambiguously misrepresented IPCC findings to the Senate. Field's testimony is here in PDF. Field: "As the US copes with the aftermath of last year’s record-breaking series of 14 billion-dollar climate-related disasters and this year’s massive wildfires and storms, it is critical to understand that the link between climate change and the kinds of extremes that lead to disasters is clear." What the IPCC actually said: "There is medium evidence and high agreement that long-term trends in normalized losses have not been attributed to natural or anthropogenic climate change"
Field's assertion that the link between climate change and disasters "is clear," which he supported with reference to US "billion dollar" economic losses, is in reality scientifically unsupported by the IPCC. Period. (More on the NOAA billion-dollar disasters below.) There is good reason for this -- it is what the science says. Why fail to report to Congress the IPCC's most fundamental finding and indicate something quite the opposite? Field: "The report identified some areas where droughts have become longer and more intense (including southern Europe and West Africa), but others where droughts have become less frequent, less intense, or shorter." What the IPCC actually said: "... in some regions droughts have become less frequent, less intense, or shorter, for example, central North America ..."
Field conveniently neglected in his testimony to mention that one place where droughts have gotten less frequent, less intense or shorter is ... the United States. Why did he fail to mention this region, surely of interest to US Senators, but did include Europe and West Africa? Field: "The US experienced 14 billion-dollar disasters in 2011, a record that far surpasses the previous maximum of 9." What NOAA actually says about its series of "billion dollar" disasters: "Caution should be used in interpreting any trends based on this [data] for a variety of reasons"
Field says nothing about the serious issues with NOAA's tabulation. The billion dollar disaster meme is a PR train wreck, not peer reviwed and is counter to the actual science summarized in the IPCC. So why mention it? Field: "For several of these categories of disasters, the strength of any linkage to climate change, if there is one, is not known. Specifically, the IPCC (IPCC 2012) did not identify a trend or express confidence in projections concerning tornadoes and other small-area events. The evidence on hurricanes is mixed." What the IPCC actually said (p. 269 PDF): "The statement about the absence of trends in impacts attributable to natural or anthropogenic climate change holds for tropical and extratropical storms and tornados"
Field: "For other categories of climate and weather extremes, the pattern is increasingly clear. Climate change is shifting the risk of hitting an extreme. The IPCC (IPCC 2012) concludes that climate change increases the risk of heat waves (90% or greater probability), heavy precipitation (66% or greater probability), and droughts (medium confidence) for most land areas." 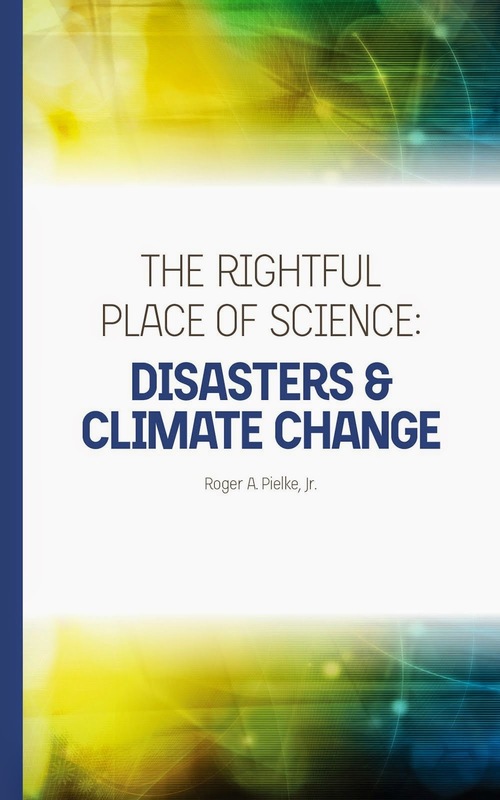 What the IPCC actually says (p. 269 PDF): "The absence of an attributable climate change signal in losses also holds for flood losses"
and (from above): "in some regions droughts have become less frequent, less intense, or shorter, for example, central North America"
Field fails to explain that no linkage between flood disasters and climate change has been established. Increasing precipitation is not the same thing as increasing streamflow, floods or disasters. In fact, floods may be decreasing worldwide and are not increasing in the US. The fact that drought has declined in the US means that there is no trend of rising impacts that can be attributed to climate change. Yet he implies exactly the opposite. Again, why include such obvious misrepresentations when they are so easily refuted? Field is certainly entitled to his (wrong) opinion on the science of climate change and disasters. However, it is utterly irresponsible to fundamentally misrepresent the conclusions of the IPCC before the US Congress. He might have explained why he thought the IPCC was wrong in its conclusions, but it is foolish to pretend that the body said something other than what it actually reported. Just like the inconvenient fact that people are influencing the climate and carbon dioxide is a main culprit, the science says what the science says. Does More Income Mean More Well Being?